Would you swap these lug bolts for lug studs? Life got in the way of getting anything done on the Saab this week, but let’s take a moment to talk about a potential modification that I’m finding very tempting. This car is one of those weirdos that uses lug bolts instead of lug nuts. This means that every time you go to install the wheels, you have to line up the holes first. 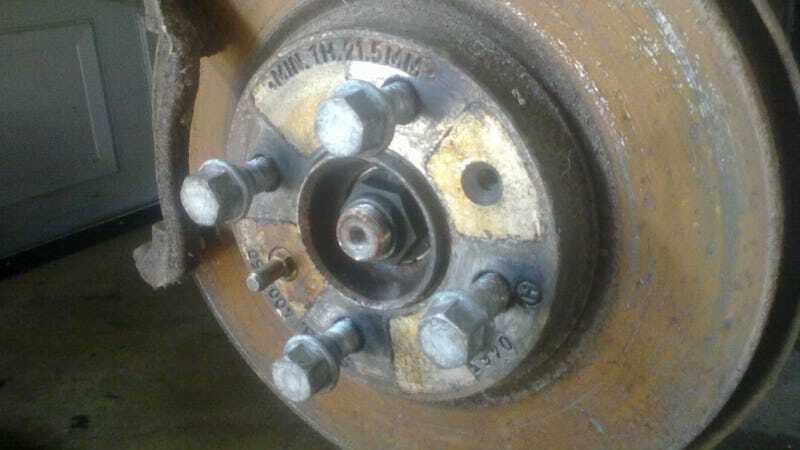 This isn’t a total nightmare, because the brake rotors are locked into place by set-screws, and there are also locater pins to help hang the wheel while threading the first bolt in. But we must be missing some hardware, because these pins and set-screws aren’t present at all four corners. The hubs are threaded to accept them, though. There’s nothing wrong with skipping this hardware, except that it makes lining up the rotor and wheel a massive PITA. Not only do the holes need to align, but you have to hold all that weight up against the hub on that shallow ring in the center. With one hand, that is, since your other hand needs to be free to thread the bolt in. Otherwise, this becomes a two-person job. Why not just convert to lug studs? If the rotors and wheels can be hung on studs while threading the nuts on, who needs pins and set-screws? Any downsides to this I’m overlooking? We could save a few bucks by keeping the lug bolts, and skipping the missing hardware. But if this were my car, that’d piss me off to no end. I don’t think it’ll take long for my brother to discover how much of a hassle this can be. It’d be much easier to threadlock some studs into the hubs and be done with it, using normal lug nuts ever after. So here’s my challenge to you, Oppo. What’s the cheapest way to convert from lug bolts to lug nuts, using sufficient quality hardware? The current lug bolts are M14x1.50, 27mm thread length, 60° seat angle. Saab 900: Fire the Parts Cannon!